Thanksgiving dinner is the big test of a home chef. Moms and grandmas through the ages have owned this meal, and it’s often a big deal when the cooking duties are passed down to the next generation. But here’s a little secret: You don’t actually have to be an expert chef or spend your whole day in the kitchen to make a nice Thanksgiving dinner. You don’t even need lots of fancy kitchen equipment. In fact, you can prepare a complete Thanksgiving dinner in your microwave. Check out the below recipes to see how, and soon you’ll be giving thanks for that trusty little appliance in the corner of your kitchen. The turkey is the star of the Thanksgiving show, but most microwaves can handle it. The trick here is finding a turkey small enough to fit in the microwave. Turkey, small enough to fit in your microwave, with about 3” clearance at the top and at least 1” on both sides. Make sure the turkey is fully defrosted. 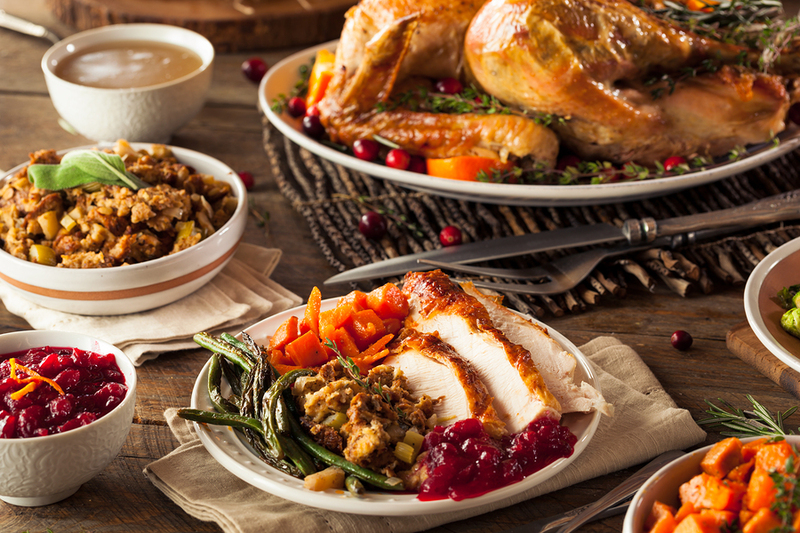 Ideally, you buy a fresh turkey or defrost in the refrigerator ahead of time, and not in the microwave. Remove the giblets (these can be set aside for gravy). Rinse the turkey, both inside and out, and pat dry with paper towels. Coat the turkey with butter or olive oil inside and out for flavor. Then dust with salt, pepper, and your favorite herbs and spices. Sage, thyme, and rosemary are standards here, but garlic and onion powder work well, too.If you like stuffing or dressing, plan to cook that separately, because stuffing the turkey changes the cooking times and can make things unpredictable. Dust the inside of your microwave bag with a little flour, and then place the turkey inside. Seal the bag but also leave a small opening for venting. Set the bagged bird into a large dish in the microwave and cook for approximately 10 minutes per pound at 50 percent power. (This may vary depending on the size of your bird and the power of your microwave, but these are good starting points, since it’s best to undercook and then add time as needed.) If your microwave oven doesn’t rotate, plan to turn the dish every 15 minutes. Remove the turkey from the roasting bag and let stand 20 minutes before carving. Microwave stuffing is easy, delicious, and way better for you than store-bought! Mix all ingredients, pour into microwave-safe casserole dish, and microwave 4 to-6 minutes on high. Serve immediately. This recipe for easy, creamy microwaved mashed potatoes and gravy will have your family asking for seconds. Wash potatoes, peel (if desired), and cut into chunks. Place in a microwave-safe dish and cover. Microwave on high for 8 minutes or until the potatoes are done. Using oven mitts, carefully remove dish from microwave. Take off the cover using oven mitts or tongs, since steam build-up can burn. Place the cooked potatoes in a large bowl. Use a masher or potato ricer to mash potatoes. Add the milk (or half and half), butter, salt, and pepper. Continue mashing until the desired consistency has been reached. Serve immediately. Whisk flour into turkey drippings. Add cream and chicken broth, and whisk until smooth. Cook in the microwave on high for 3 minutes, then remove and add salt and pepper to taste. Sure, you could serve cranberry sauce out of the can, but it’s pretty easy to make fresh cranberry sauce in your microwave. Put all the ingredients into a 3-quart microwave-safe bowl, mixing well, and cover with wax paper. Microwave on high for 5 minutes. Stir and cover with wax paper again. Microwave 5 to 7 more minutes or until the cranberries pop and the sauce has thickened. Let stand, covered, until cool. Chill in the refrigerator for at least 3 hours. Last but certainly not least, we come to the microwave pumpkin pie. Since your microwave does not have a bake option, this one might feel like a cheat despite the filling being from scratch. Hey, there’s always the store-bought option, and most store-bought pumpkin pies elicit very few complaints. Place the crust into a microwave-safe pie plate. Prick the bottom and sides with a fork. Microwave uncovered for 2 minutes. Give the dish a 1/2 turn, and microwave for 2 to 3 more minutes, or once the crust has a flaky look to it. Separate 2 eggs. (You’ll use the whites later for the meringue.) Beat the egg yolks, then add other filling ingredients. Microwave uncovered to boiling (approximately 7 to 8 minutes), stirring every 2 minutes. Pour the filling into the pie shell. In a separate bowl, beat the egg whites and cream of tartar until foamy. Continue beating, adding a spoonful of sugar at a time, until stiff peaks form. This goes faster if you have a mixer, but you can do it by hand with a whisk! Spread the meringue on the pie, making sure you seal it to the crust at the edges. Microwave uncovered until meringue has set, about 1 1/2 minutes. Chill for at least 4 hours.